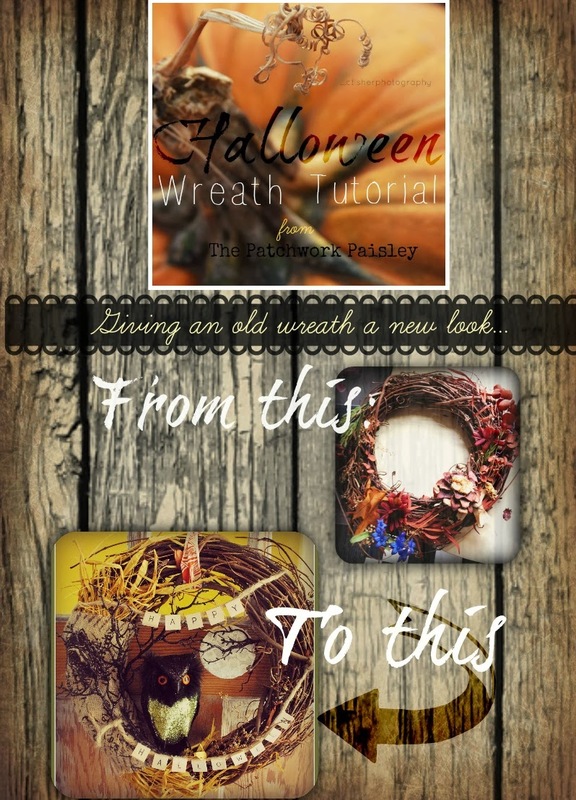 With all the amazing wreath ideas floating around Pinterest and the blog-o-sphere, how could I resist the opportunity to make one myself? My glue gun was calling my name! Still, I knew that if I told my husband I had to go buy another wreath form, "Sure honey, go crazy!" is not what I would hear from him. SO- I took a trip to AC Moore for a fresh 100 count bag of hot glue sticks, and left with a sparkly owl and some black shimmering tree branches (and that was showing restraint!) Luckily I had an old wreath hanging around with boring fake flowers woven through it. It was cute when I made it about 7 years ago, but it badly needed a makeover- yay! 1. I recently discovered the patterned burlap that Joann Fabrics is selling and have made every excuse possible to buy some whenever I blow through there. I am all about the rough texture and versatility of burlap and nothing says farmhouse like a would-be potato sack! I started by cutting a long, 3.5in. 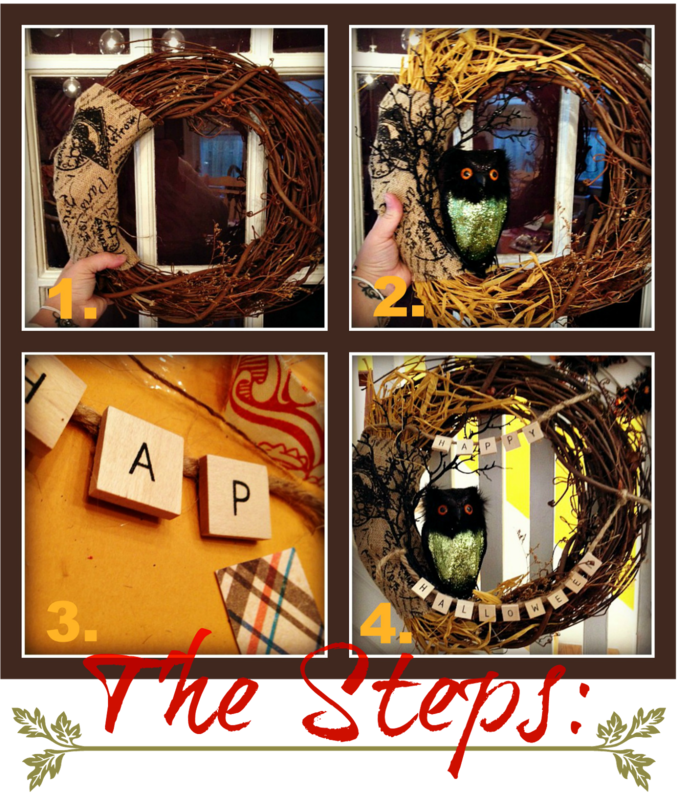 strip of printed burlap and wrapped it around one side of the wreath tightly, securing it with some hot glue. 2. Farm=straw, right? I almost threw out a 5 lb bag of raffia (basically a waxy and soft material that looks a lot like straw) that was taking up space in my art closet at school. As I do with most things, I hoarded it in my studio in stead. I knew it would come in handy one day! It supports the rustic feel and took zero time to just stuff under the ends of the burlap. Once I added the owl perched off to the side, the black sparkly tree branches were an obvious addition. They play off the sparkles on the owl himself and provide a little perch. 3. I lucked out a few weeks ago when I found these not quite scrabble letters, newly packaged for sale at our neighborhood garage sale for $.25! I used some hot glue to attach them to some hemp rope for a simple "Happy Halloween" statement. 4. This is the moment when I have to rein it in a bit. It is so easy to over do it when the possibilities are endless and you have so many fun materials to play with. I decided then to leave the right side mostly bare and thought to myself, "How cool would it be if there was a moon behind the owl??" I actually wanted to make it light up too, and I still might add a little battery operated candle, but the ones I have flicker and, well, the moon doesn't. I wanted to keep the moon translucent in case I actually do get a chance to add a light to it. It also had to be light weight. I decided to use some 18 gauge wire I had to create a circle. In order to make it perfectly round, I doubled it up and twisted it together, then wrapped it around the top of a candle and gently pulled it off. It turns out the AC Moore bag was the perfect material for my translucent moon, so I glued wire to a piece of the plastic, then trimmed around it. It worked great, but didn't look too cute as it was, so a little bit of white lace on top maintained the translucency, but added a pretty textural element that I really ended up loving. Attaching it to the wreath just took the addition of one more sparkly branch, and it was light enough to glue it to the back so that it hovered right behind Mr. Owl. The finished wreath really adds the perfect touch of Spooky, farmhouse Halloween to my front door. There are so many great options for door decor, What's adorning yours this season?? oh it's so cute, I love that you took us through your creative thought process!!!! 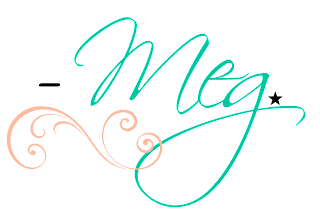 so cute, Meg! I love the burlap and the lace for the moon. I LOVE this!!!! Like omg I need one love this haha. Not that I have anywhere to put one, maybe some day ;). Amazing job mama!! This is ridiculous. Effing ridiculous!!! I would buy this IMMEDIATELY UPON FINDING (in text language that would be IUF). 1.This is so cute. 2. I am soooo into owls right now. 3. You might actually put a light behind that moon - I would die. 4. I love burlap. Like I would marry burlap. Used burlap for table runners at our wedding and as a backdrop with stencil work for a photo booth. Did you ever see that pin on how to wash burlap. Do you know how. I need that. 5. I wish we lived closer so we could have an arts and crafts play date. 6. How long did this take you?? So again, I loved it. Very cool! I love it! That owl is awesome, I love the glitter bottom. Everything just looks so good together! You really did an amazing job! SO cool - I love it!! I found these cool ravens last week. brought one home, put it on the mantle, and my kittens promptly ate it!!! So now I'm thinking I could get another one and put it in a wreath... Hmmmmm... thanks for the awesome idea!! :) And the pics in this are awesome - nice job!! p.s. I'm dying to see more about your pallet project! So creative!!! I love it! And you have such an eye for layering! Totally pinning this! This is such a great wreath!! I love all of the layers, and that owl is awesome!! Love the owl but that Moon-- swoon! Great work love. 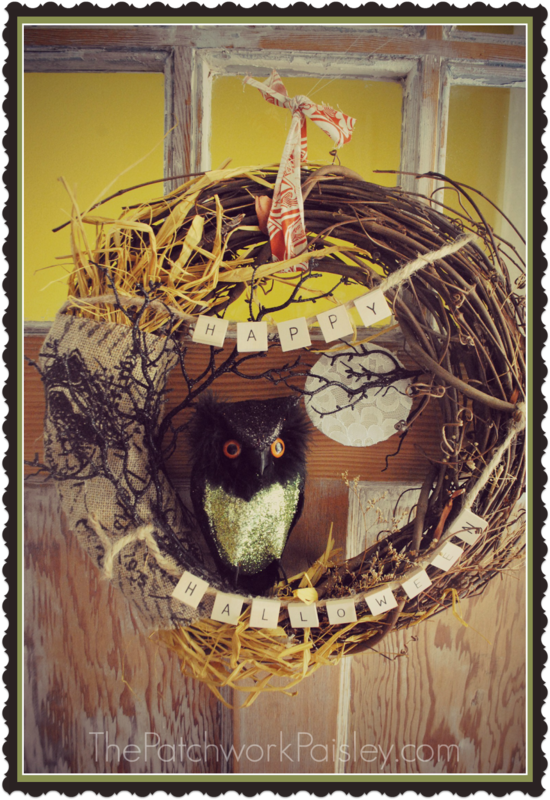 Love this owl wreath, and the moon, so awesome! My step-beauty (daughter) would love it. She's crazy about owls.